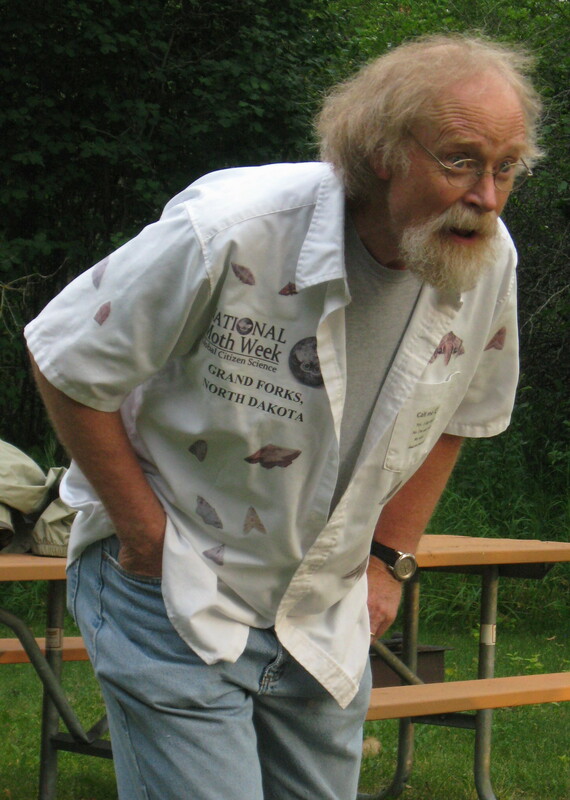 Here’s what we have planned for Moth Week 2014 in North Dakota! 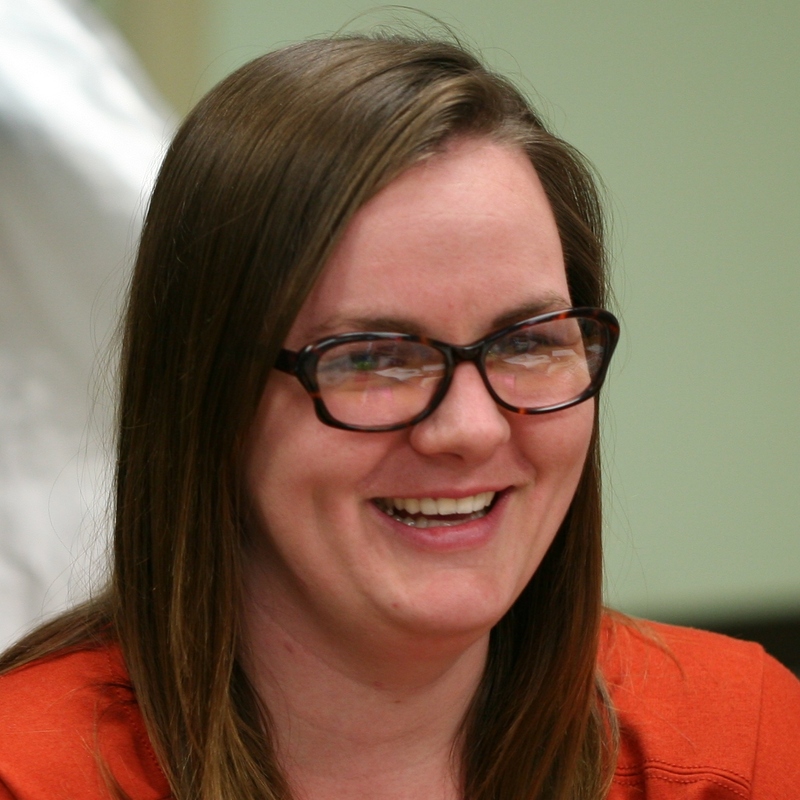 Meet the people who were involved in planning and implementing North Dakota’s ‘Moth Month’ and ‘Moth Week’ events for July 2014. July 6-27 – Display Cases at the Grand Forks Public Library. 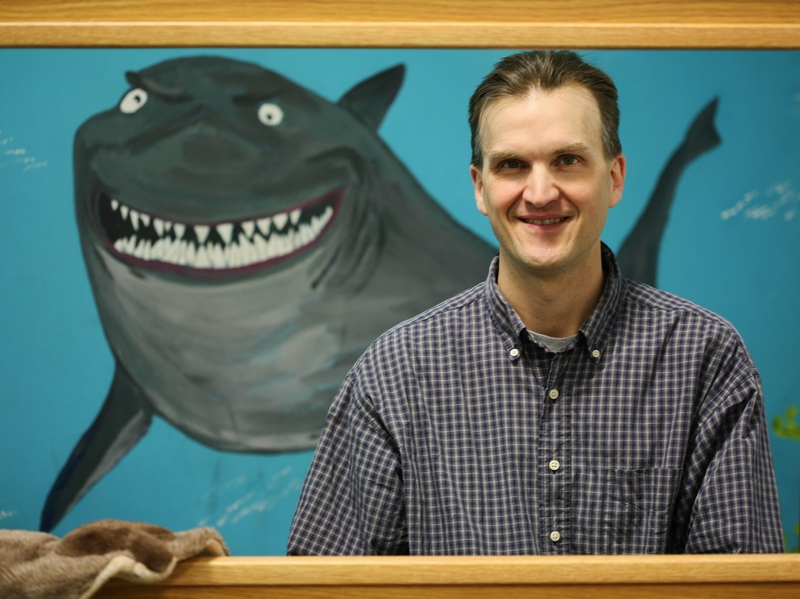 See the three ‘Moth Month’ display cases at the Grand Forks Public Library. The display case on the main floor introduces close up images of moths and moth anatomy. The display cases on the second floor feature live spurge hawkmoth and tobacco hornworm sphinx moth caterpillars. 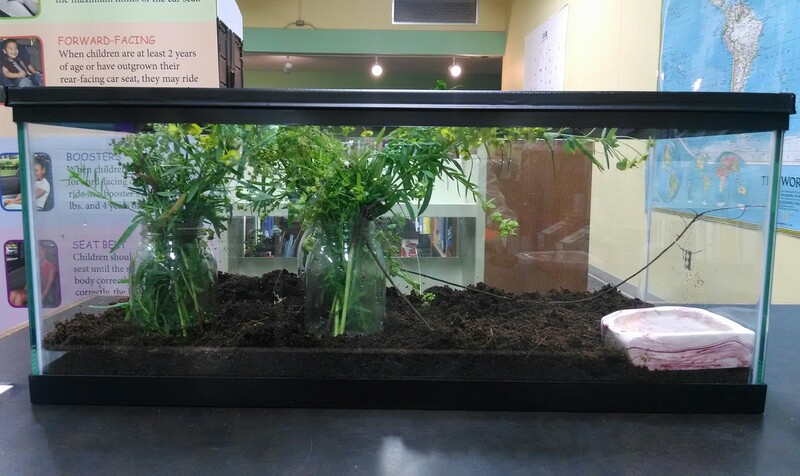 Laci prepared this screened terrarium complete with peat-like coconut coir. It currently houses six Spurge Hawkmoth larvae that feed on fresh cuttings of leafy spurge. 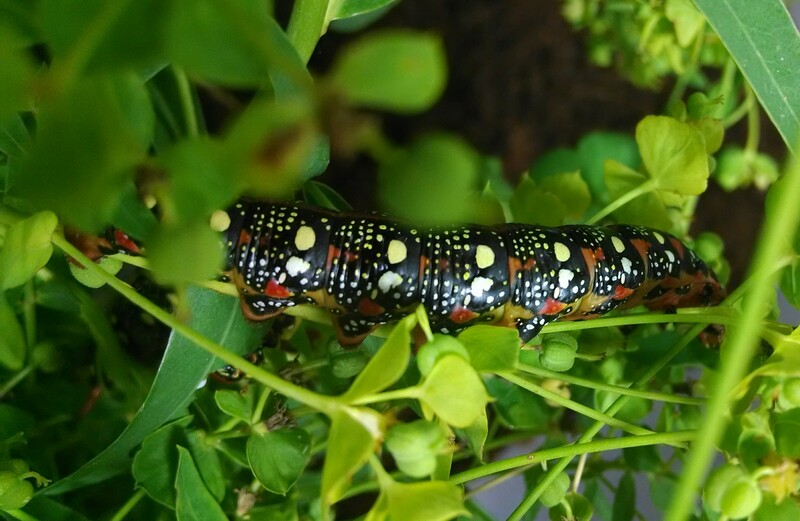 Spurge Hawkmoth larvae are large boldly colored, highly patterned caterpillars. 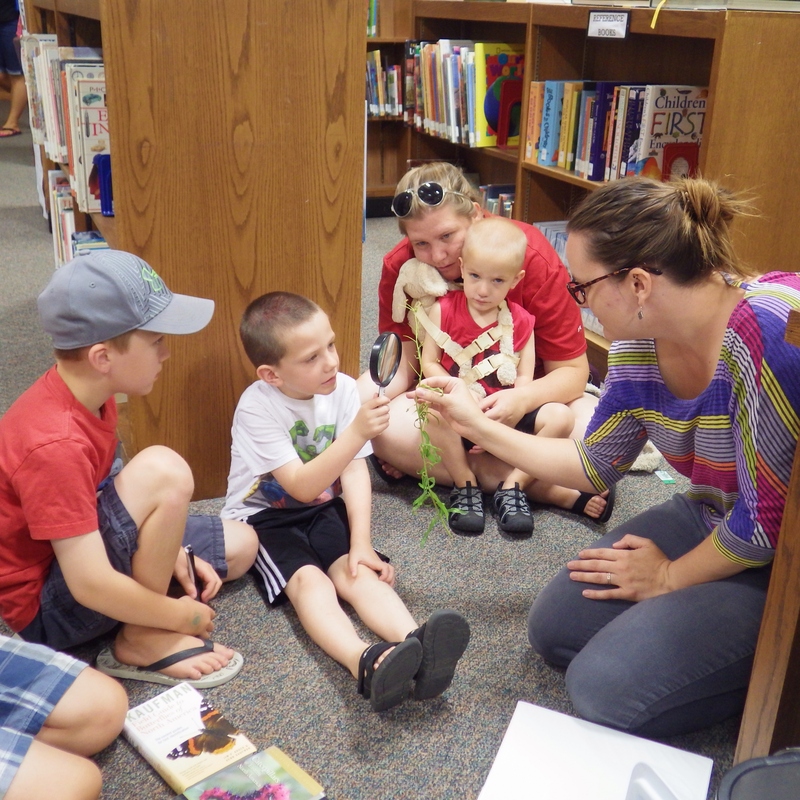 Sunday, July 13 – STEM Activities: Learning about Moths at the Grand Forks Public Library. 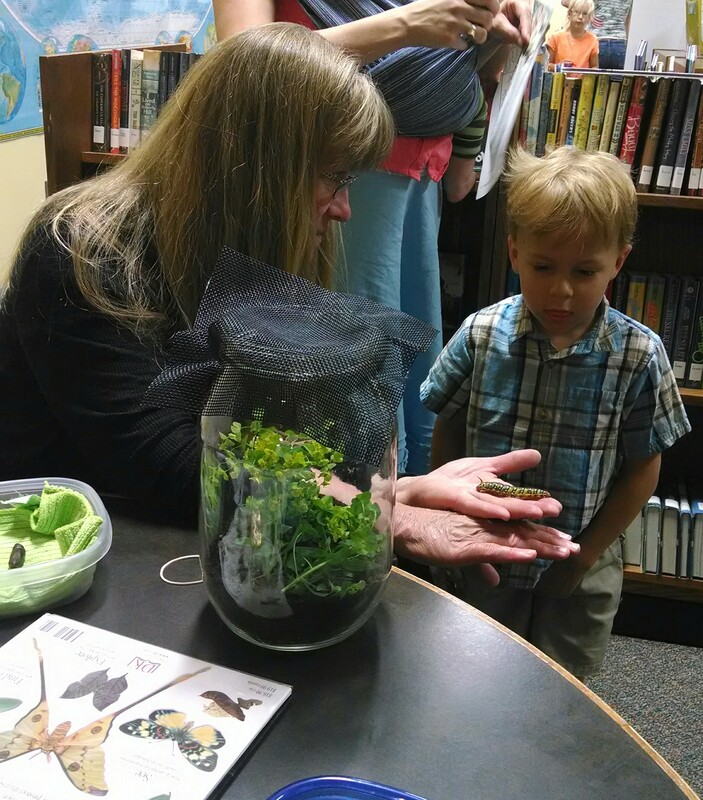 From 2-3:00 p.m. Sunday afternoon the Dakota Science Center sponsored several hands-on activities that introduced children of all age groups to the wonderful world of moths and moth caterpillars. 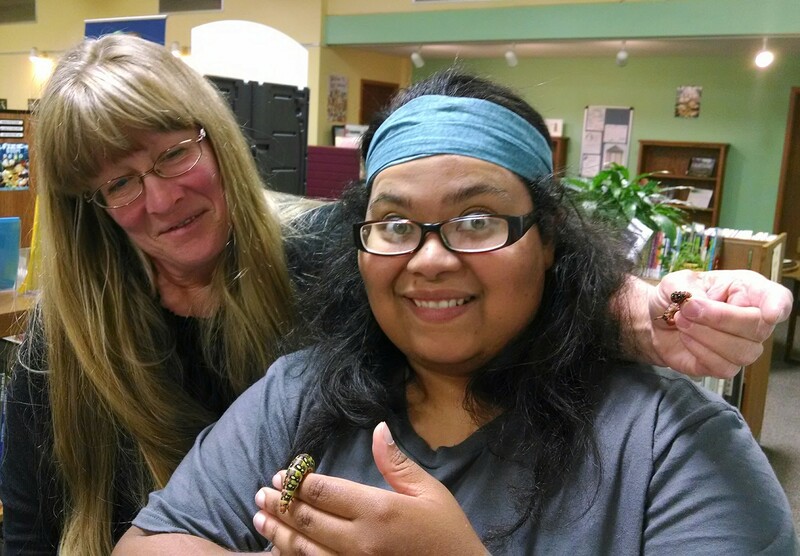 Few can match either Sharon’s or Katherine’s infectious enthusiasm for moth caterpillars (except for Becky). Sharon introduces children to the caterpillar, pupae and adult stages of the Spurge Hawkmoth life cycle using real caterpillars, pupae and moths. 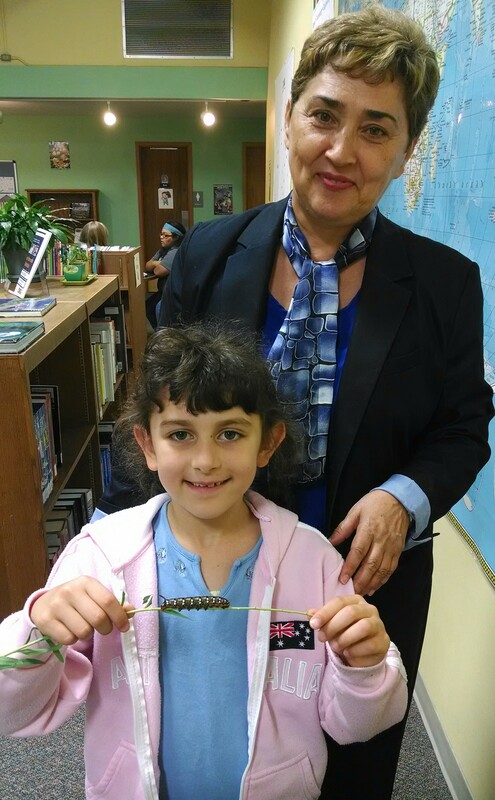 An appreciative child and adult pose for a photo with a Spurge Hawkmoth caterpillar. Thank you for this STEM opportunity, Laura and Aaron! 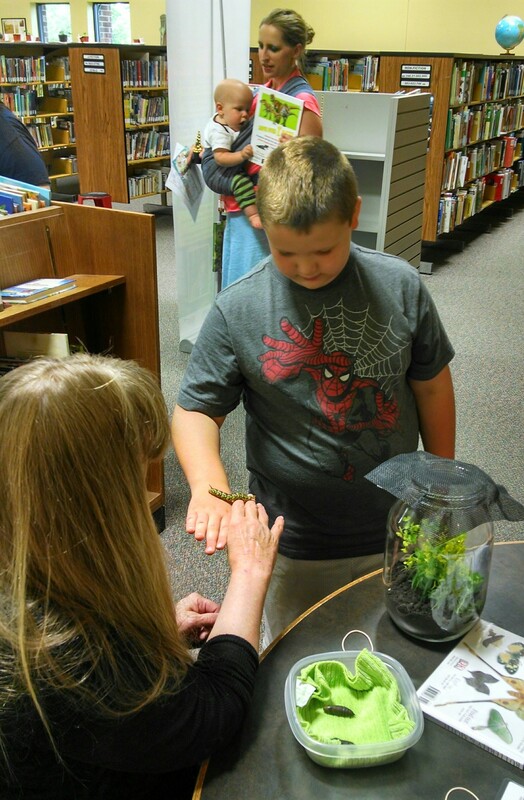 Wednesday, July 16 – Dakota Science Center ‘Garden Club’ Activity: Bees, Butterflies, Moths and Caterpillars. From 11-12:00 noon on Wednesday, Kaitlyn Kelly and Carl participated in a ‘Garden Club’ activity at the Grand Forks Public Library. The aim was to help children better understand the roles these insect play in the production of the food we eat. After a lesson on insect pollinators, Kaitlyn Kelly encouraged children (and parents) to carefully examine several species of live local moths (e.g., Ceratomia, Grammia, Leucania, Simyra, Crambus, and Cydia) as well as a Monarch Butterfly (Danaus plexippus). 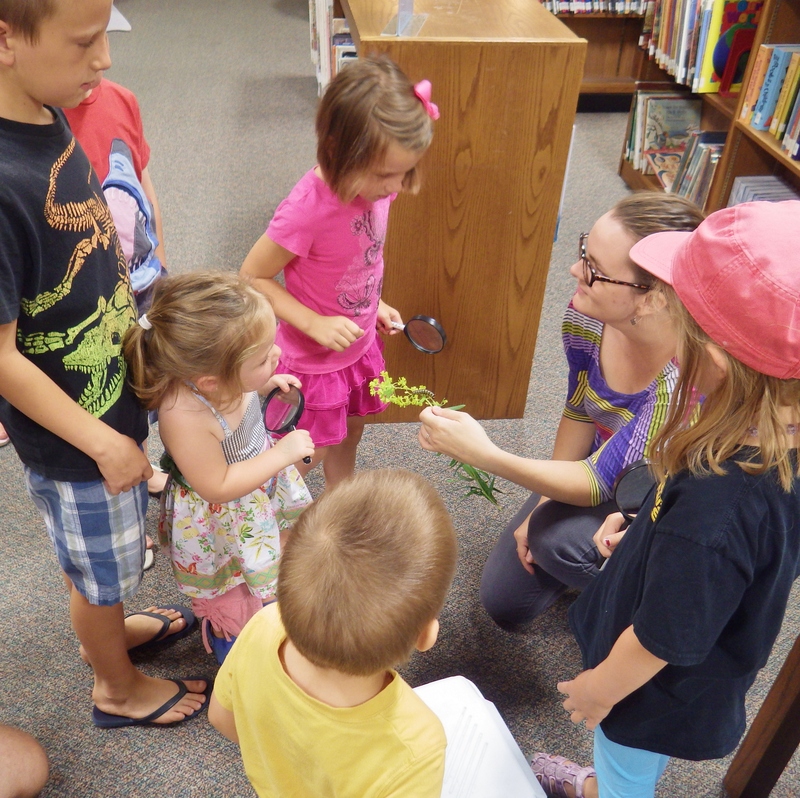 Children enjoyed using magnifying glasses to look at a large caterpillar the Spurge Hawkmoth (Hyles euphorbiae) display case at the Grand Forks Public Library. And they even got to get a close look a shed cuticle from one of the caterpillars! 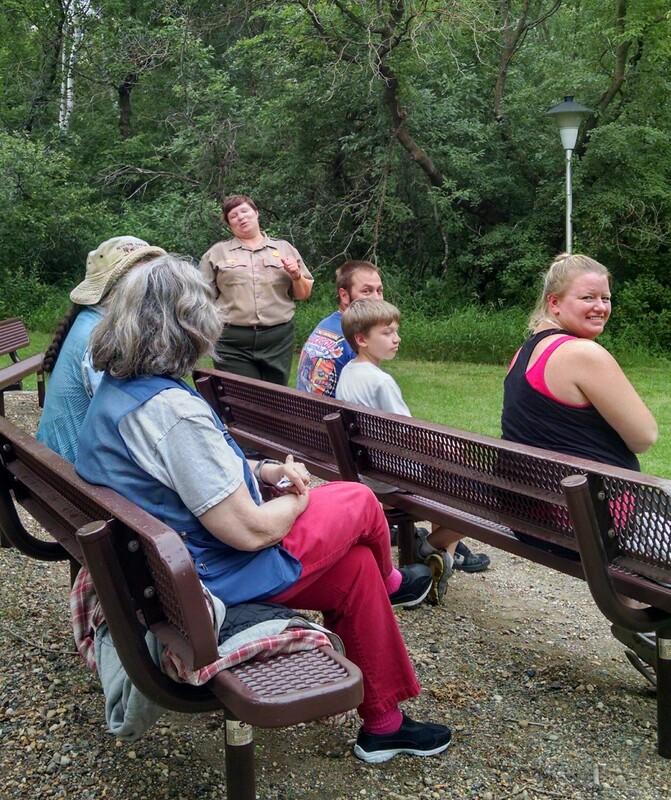 Friday, July 18 – Public Presentation at the Turtle River State Park. Amphitheater, Turtle River State Park, Arvilla. The presentation begin at 8:30 p.m. and enthusiastic moth-watchers ‘mothed’ until after 11:00 p.m.
Dr. Rebecca Simmons explained how some species of moths have evolved some very clever strategies to avoid predators as well as some astonishing ways to communicate with one another in their efforts to reproduce on the darkest of nights. 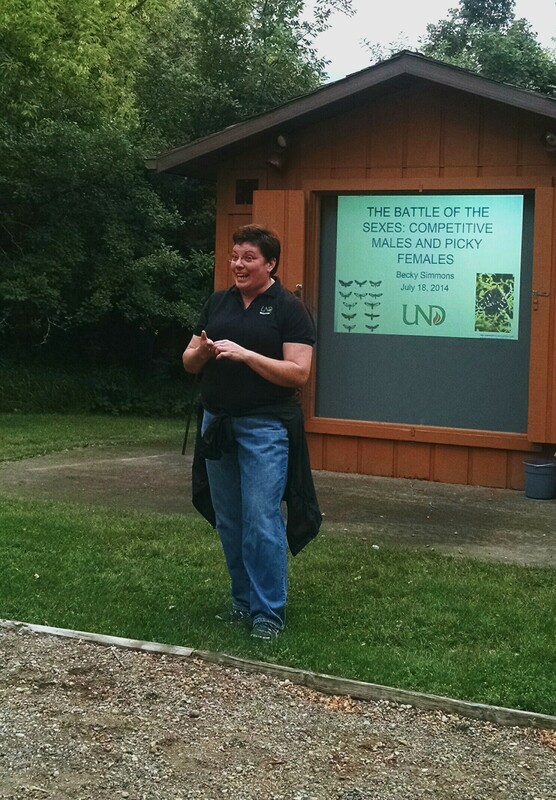 Laci Prucinsky provides an overview of the history of National Moth Week before introducing our speaker, Beck Simmons. 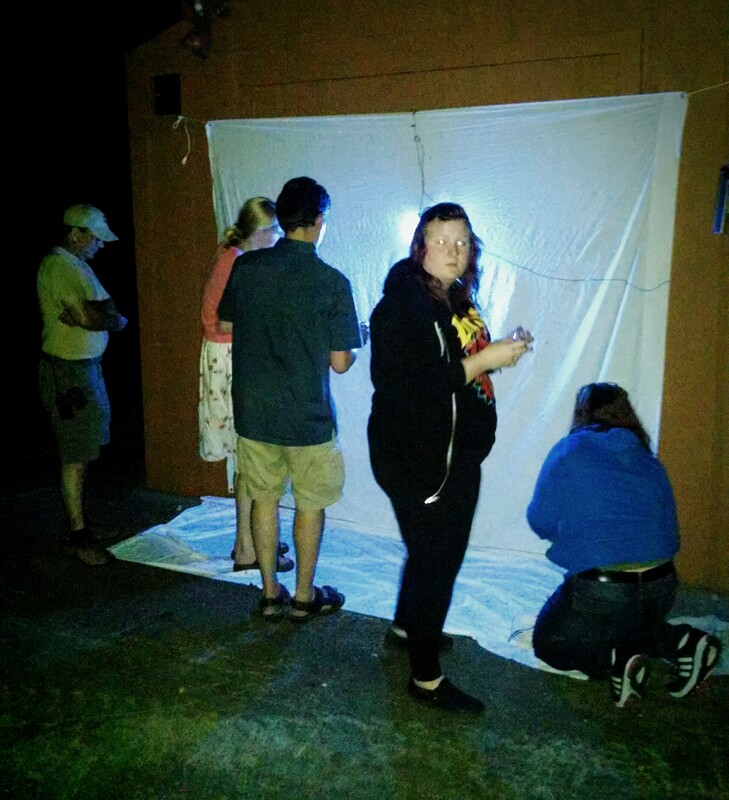 Later, after Becky’s presentation, moth-watchers gathered around the sheet to capture and identify local moths. 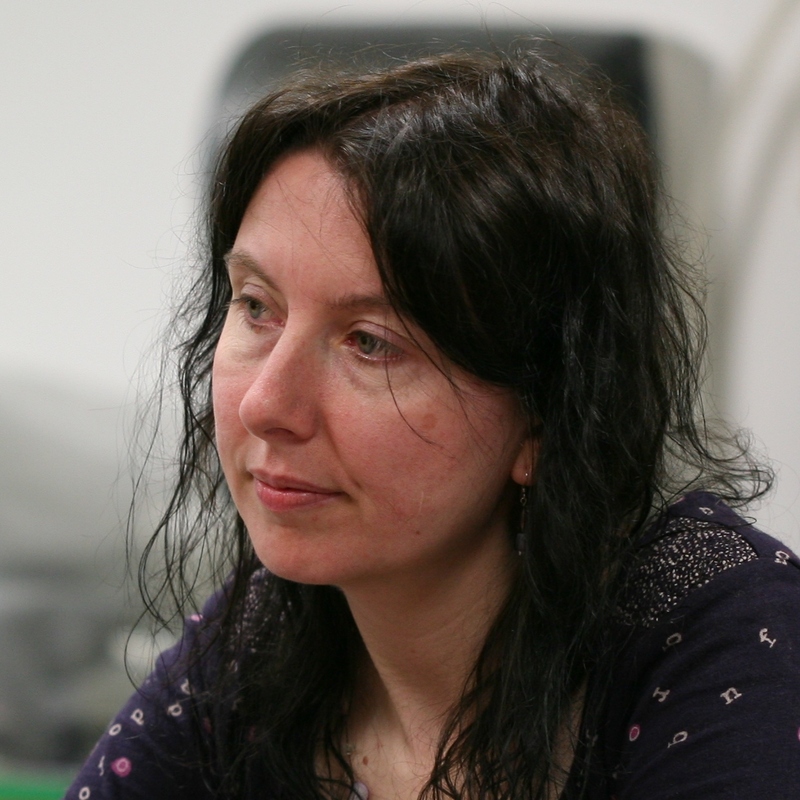 Photographs of moths captured during NMW 2014 will be archived here. 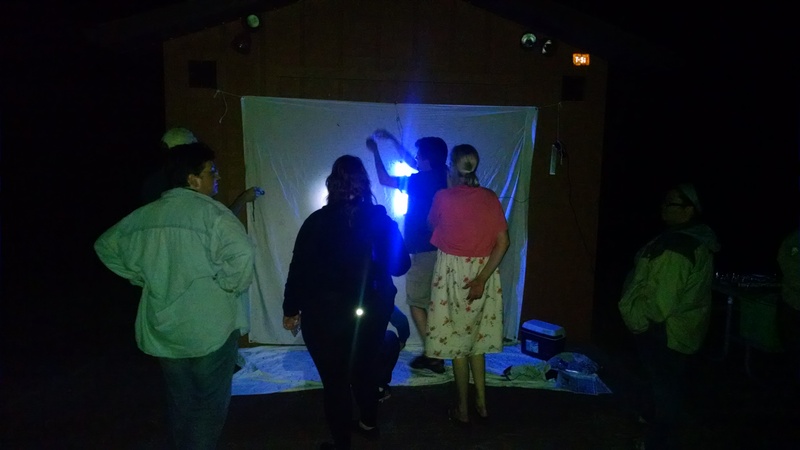 A few local toads joined enthusiastic moth-watchers at the illuminated sheet to look for moths at the Turtle River State Park, Arvilla, North Dakota on Friday evening, 18 July 2014. 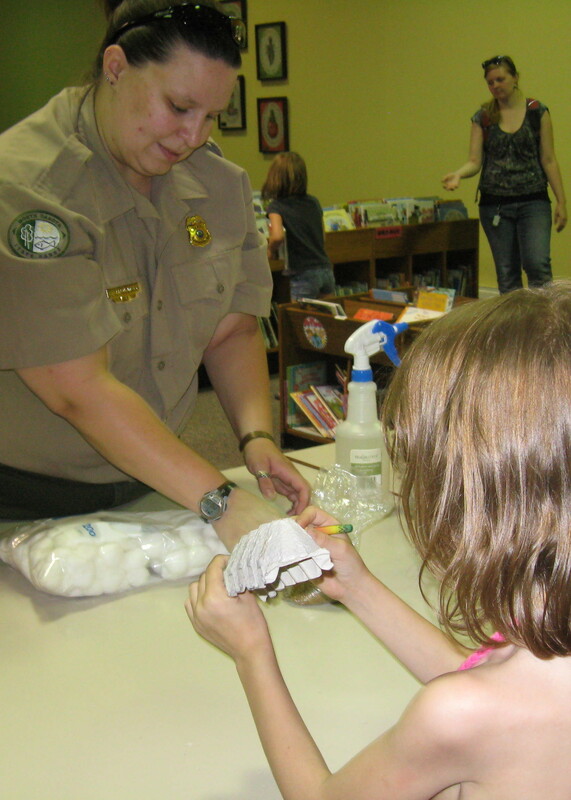 Saturday, July 19 – Science Activity at the Turtle River State Park. 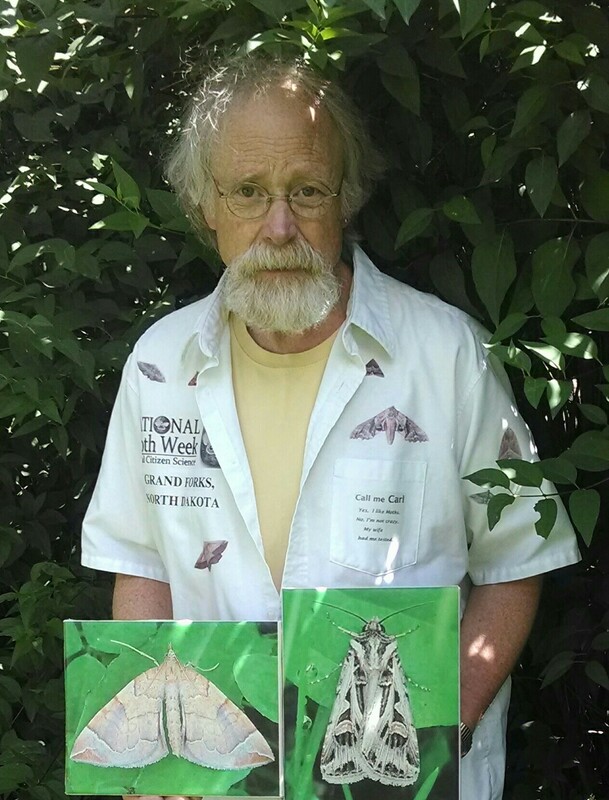 These two photos (above) show Carl and Laci during National Moth Week 2013. 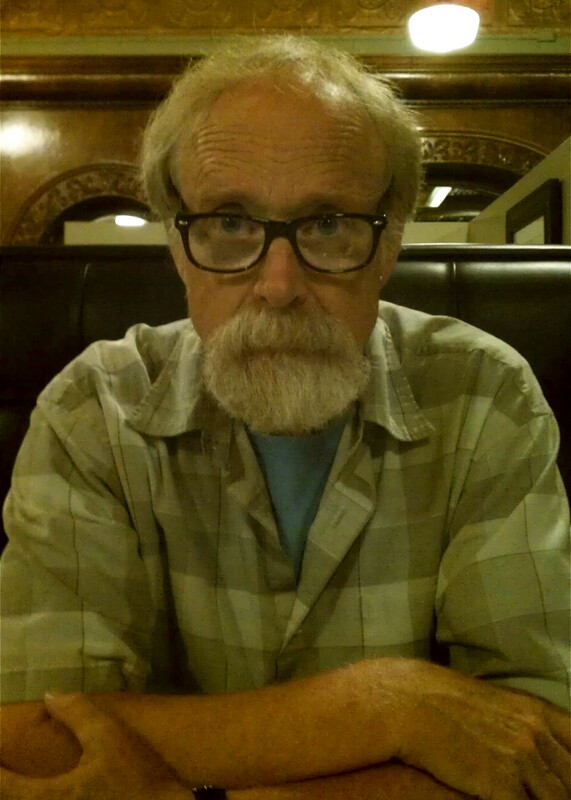 These two photos (above) show participants on Saturday evening, 19 July 2014. A Make-and-Take Science Activity for Children. 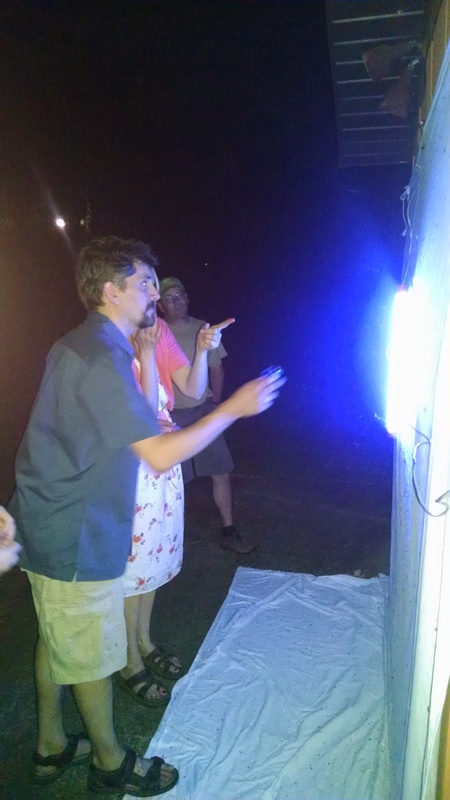 Laci Prucinsky and Carl Barrentine introduced the notion of Porch-light Biology and children made their own personal mini-mothing sheets to take home. The activity began about 8:30 p.m. 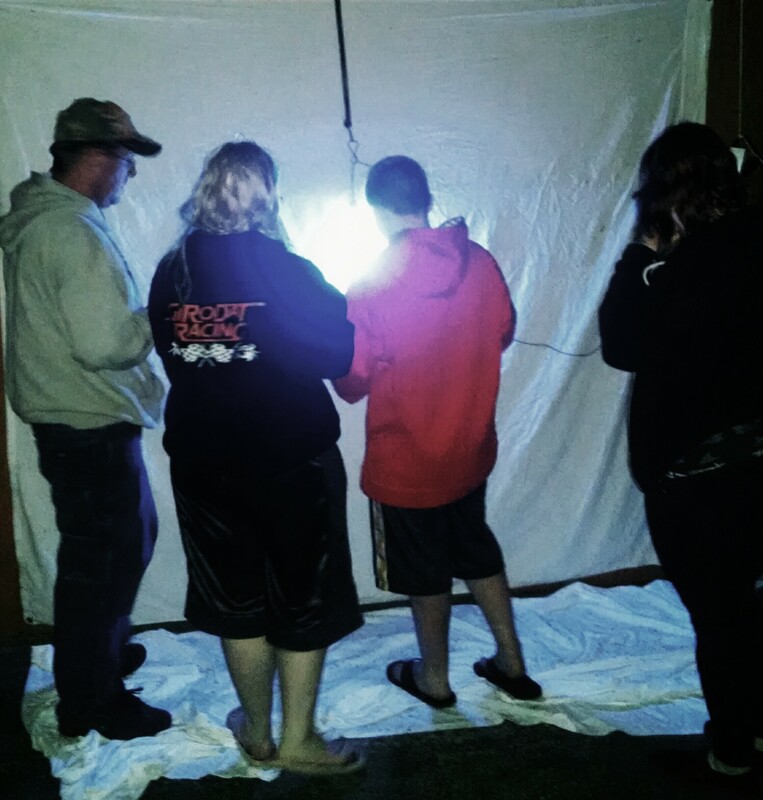 Many participants remained until nearly 11:15 p.m., night-lighting moths with Laci, Becky, Kevin, Katherine and Carl. Ashley wins the price for ‘Best Moth-snatcher’! 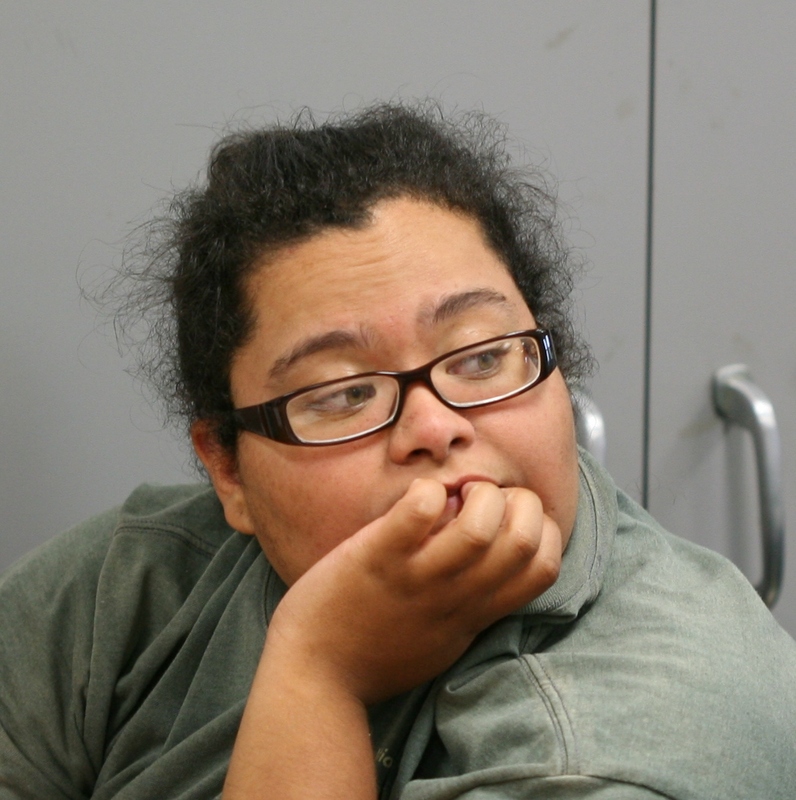 Too boot, Ashley and her mother ‘mothed’ both nights at Turtle River State Park! 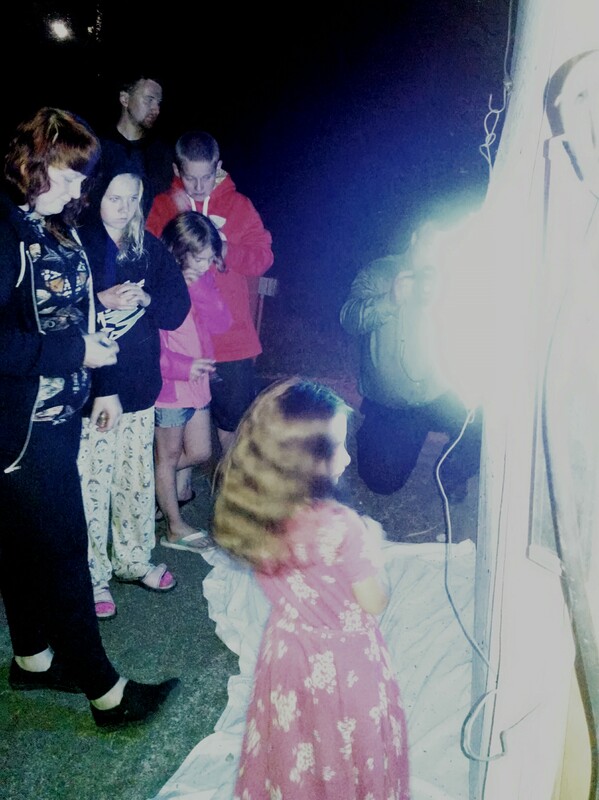 Click here to view images of the moths we observed on Saturday night. 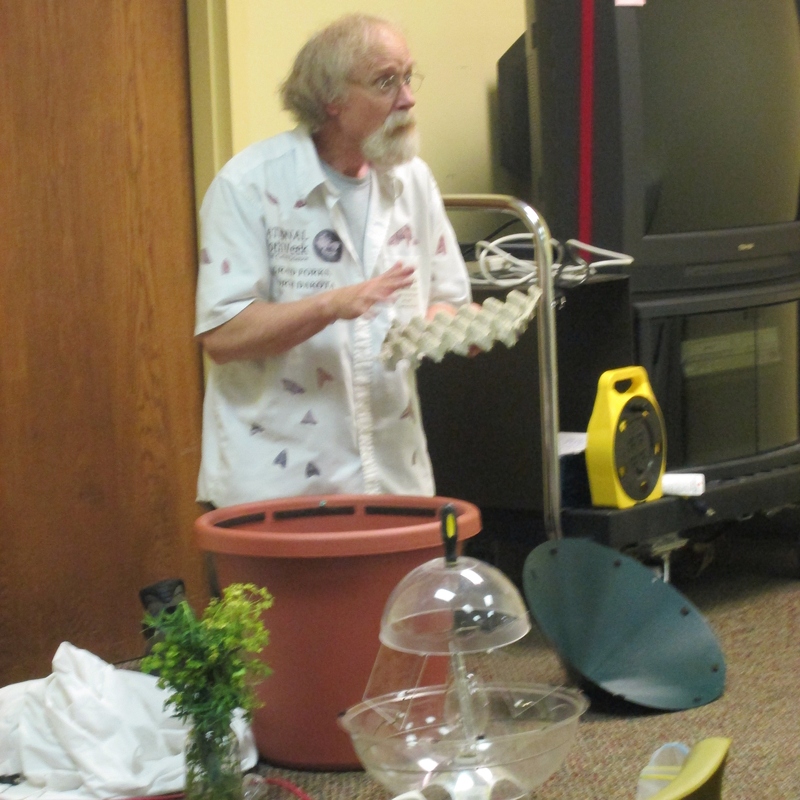 Tuesday, July 22 – STEM Presentation: ‘Much Ado about Mothing,’ at the Grand Forks Public Library. Carl Barrentine shared his personal allure for the ‘Dark Side of Biology’ at 7:00 p.m. on the second floor of the Grand Forks Public Library. 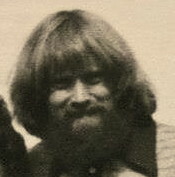 Photos by Douglas and Laura Munski. Thank you! 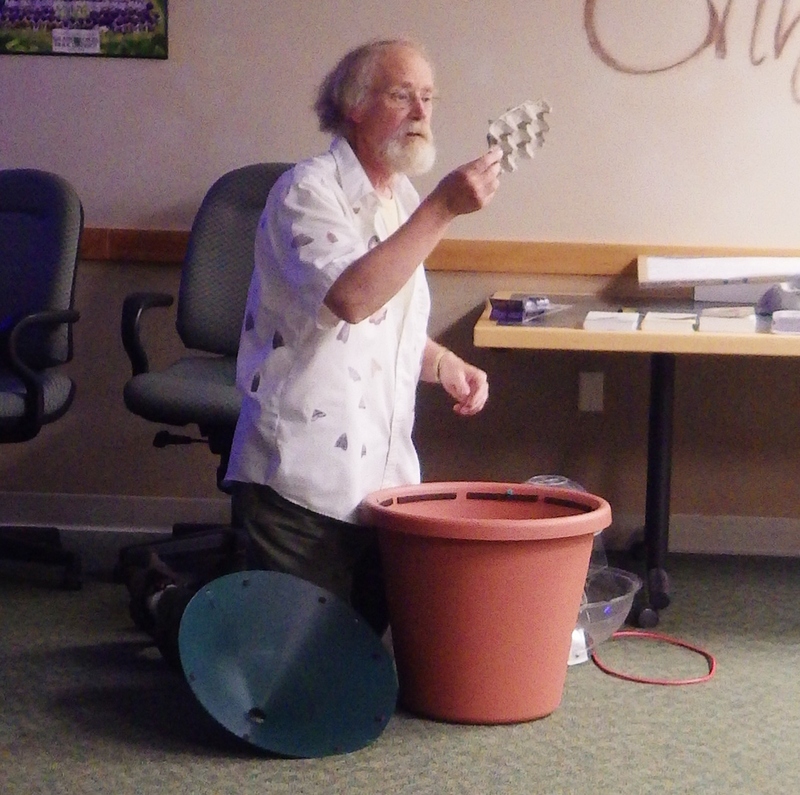 Carl explains how a light-trap is used to catch moths. Carl employs the computer to introduce his website, The Dakota Naturalist, and shows how it links with images from the Moth Photographers’ Group and BugGuide.net. 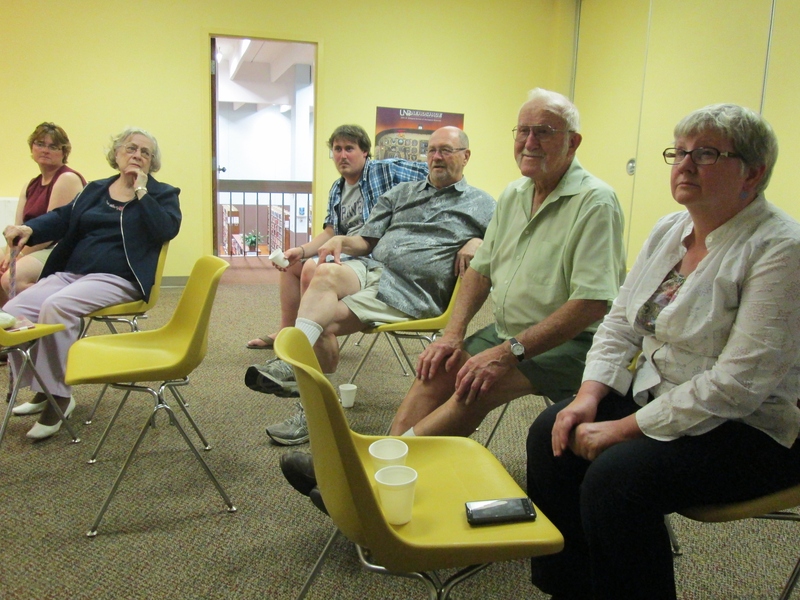 Audience members exhibit much curiosity and ask many great questions! 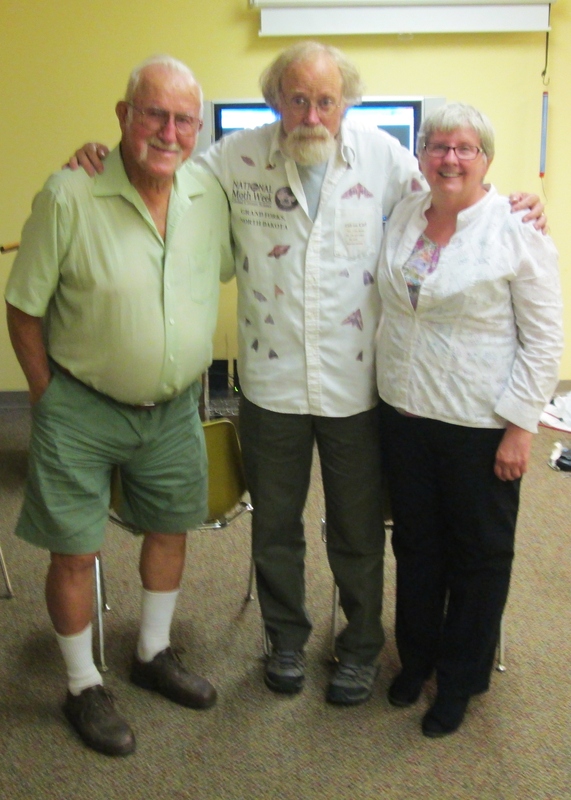 An appreciative couple linger after the presentation to have a photograph taken with Carl. This was unexpected, and very special! 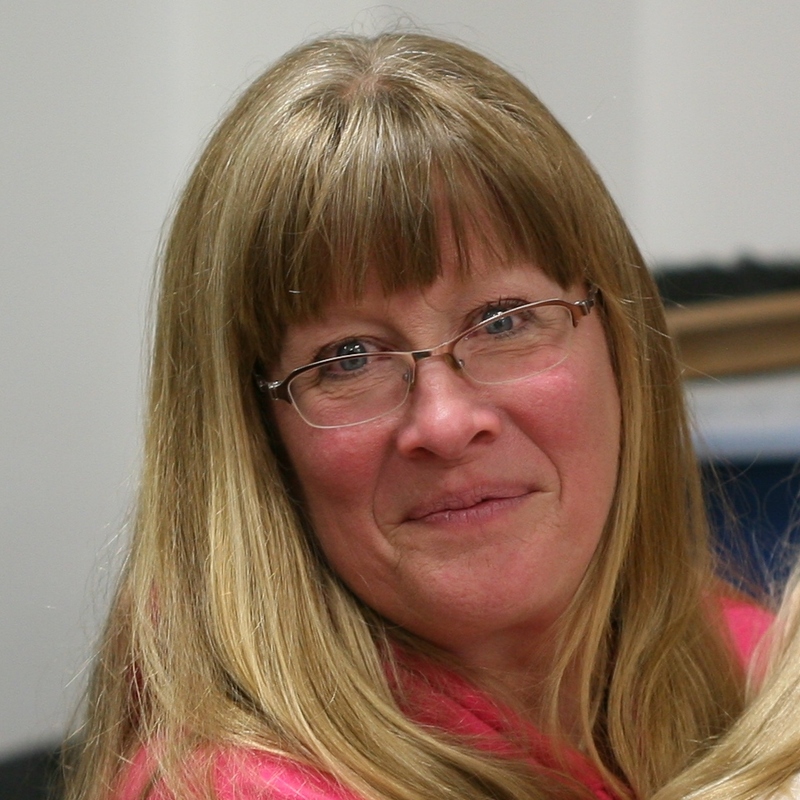 Thursday, July 24 – Audubon-lite Presentation: ‘Mothing’s Hot when Birding’s Not’. 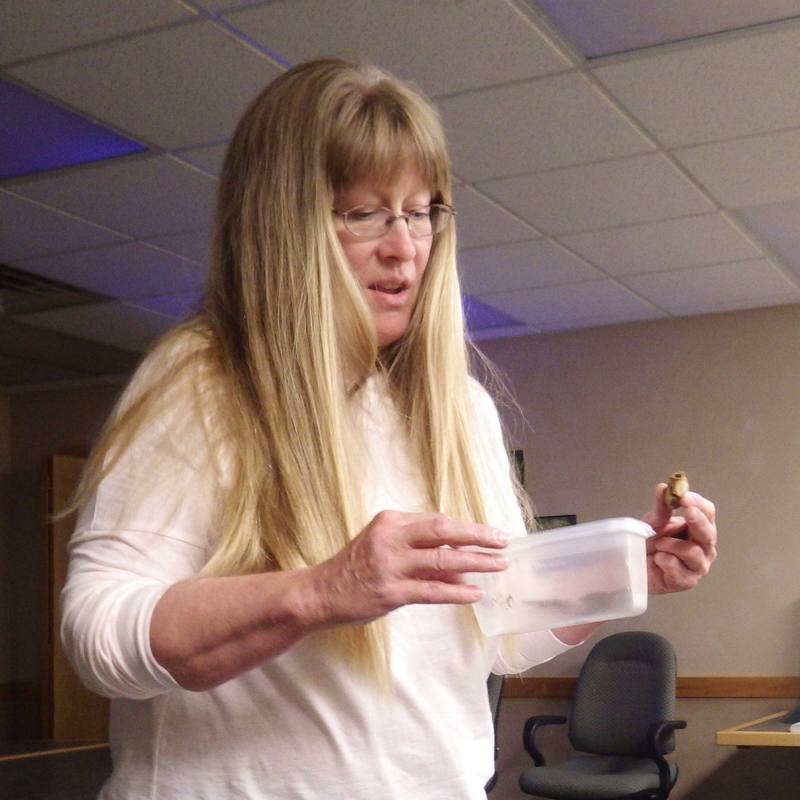 Sharon Watson and Carl discussed their summertime enthusiasms for caterpillar-rearing and moth-watching in northeastern North Dakota. 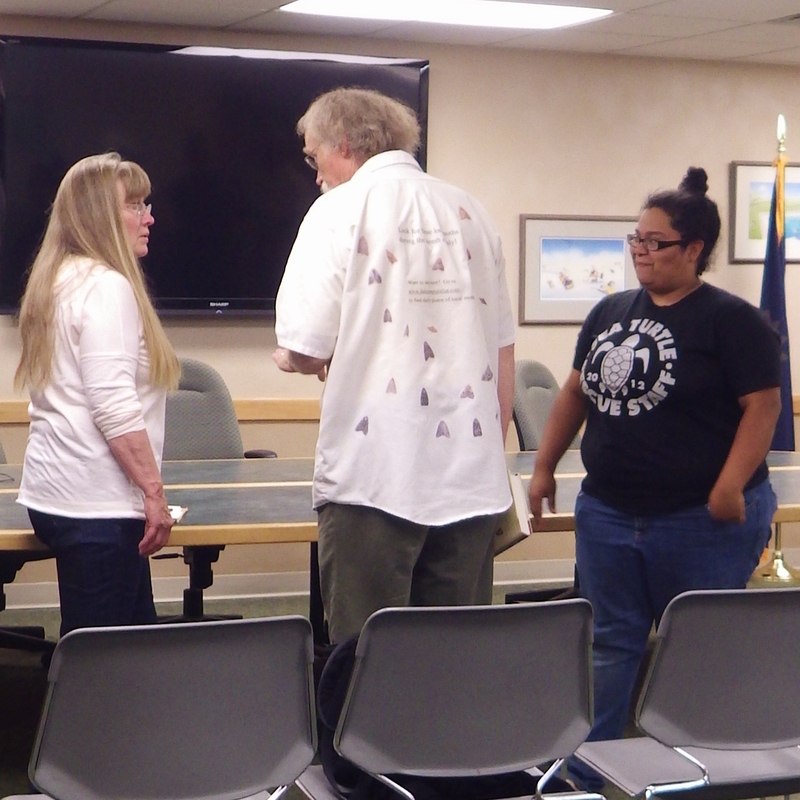 Their presentation was from at 7-8:30 p.m. at the Grand Forks Park Board Meeting Room, near the Purpur Arena. 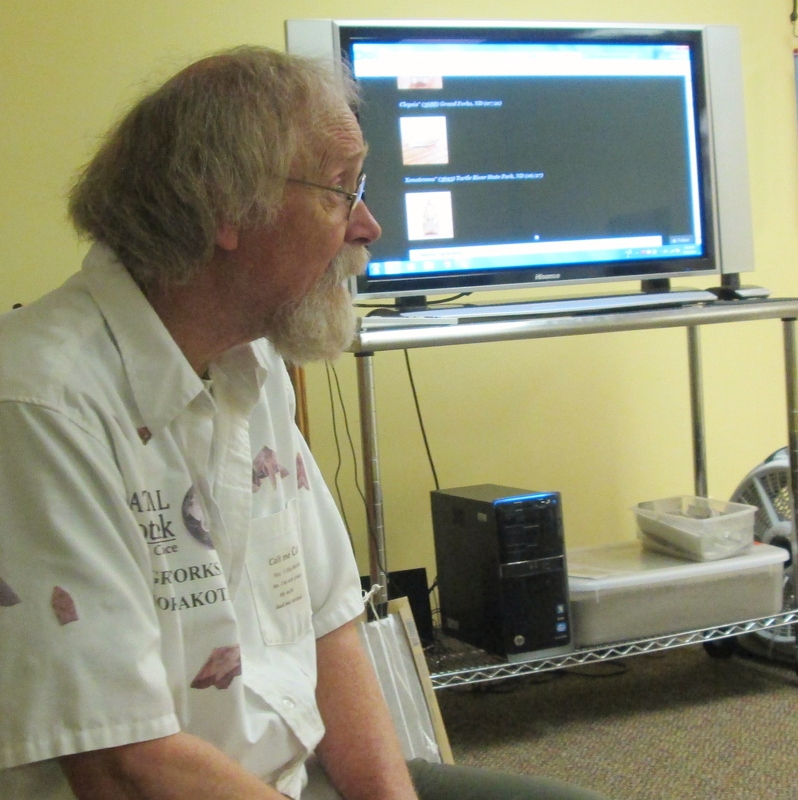 Carl introduced participants to local and national internet resources (e.g., Dakota Naturalist, Moth Photographers Group, and Bug Guide), then introduced techniques for capturing moths. Sharon introduced participants to her work capturing and photographing moths as well as rearing Hawk Moth and Silk Moth caterpillars. 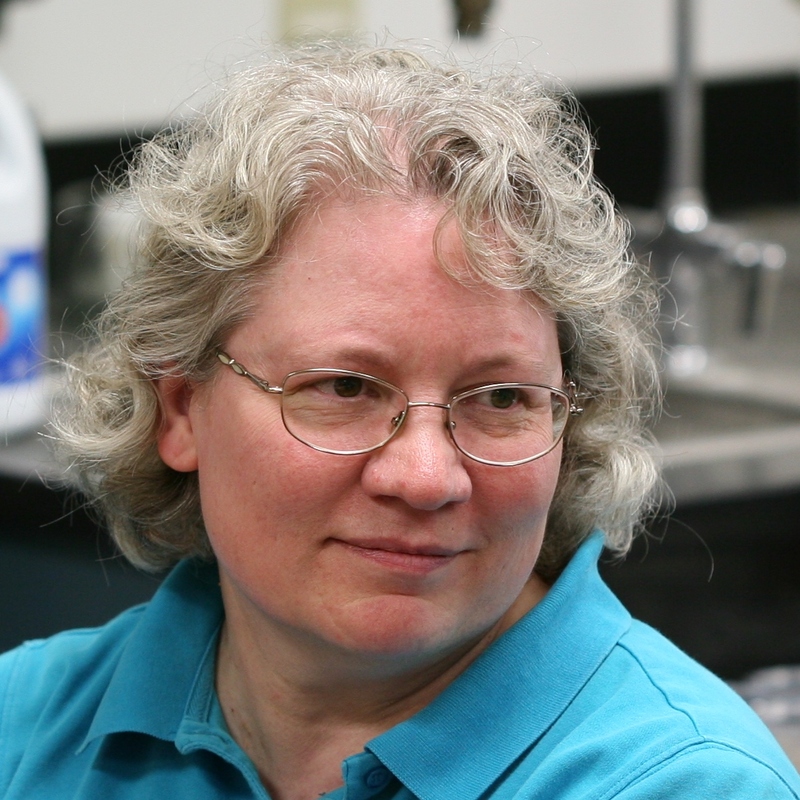 She brought live specimens for participants to examine and handle. 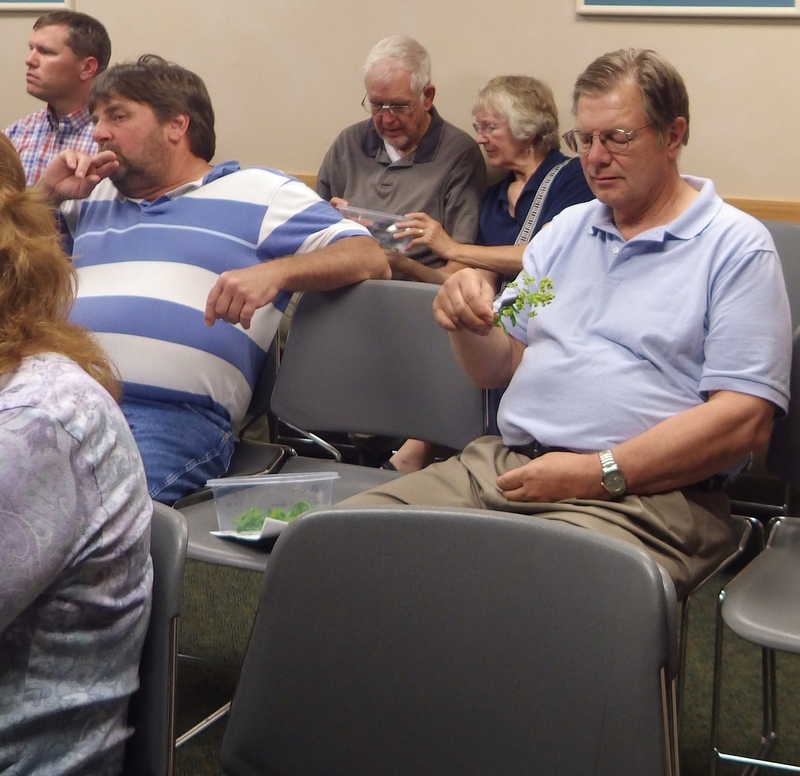 Participants examine Hawk Moth and Silk Moth caterpillars. Sharon, Katherine and Carl visit to discuss rearing caterpillars after the presentation. 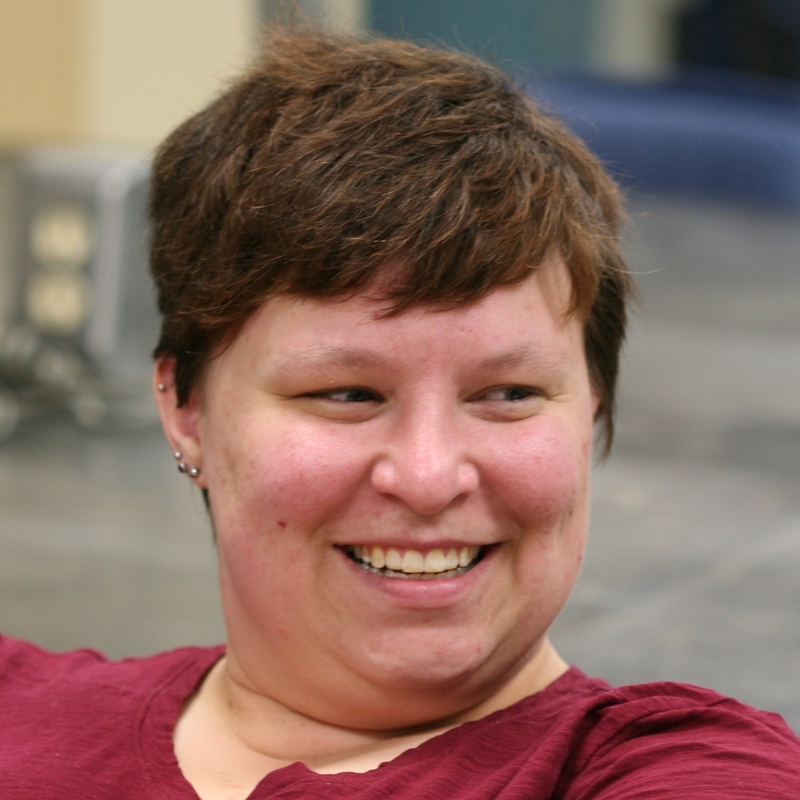 Katherine is currently raining over 700 Grammia caterpillars (of three species) as part of her graduate thesis research at the University of North Dakota. 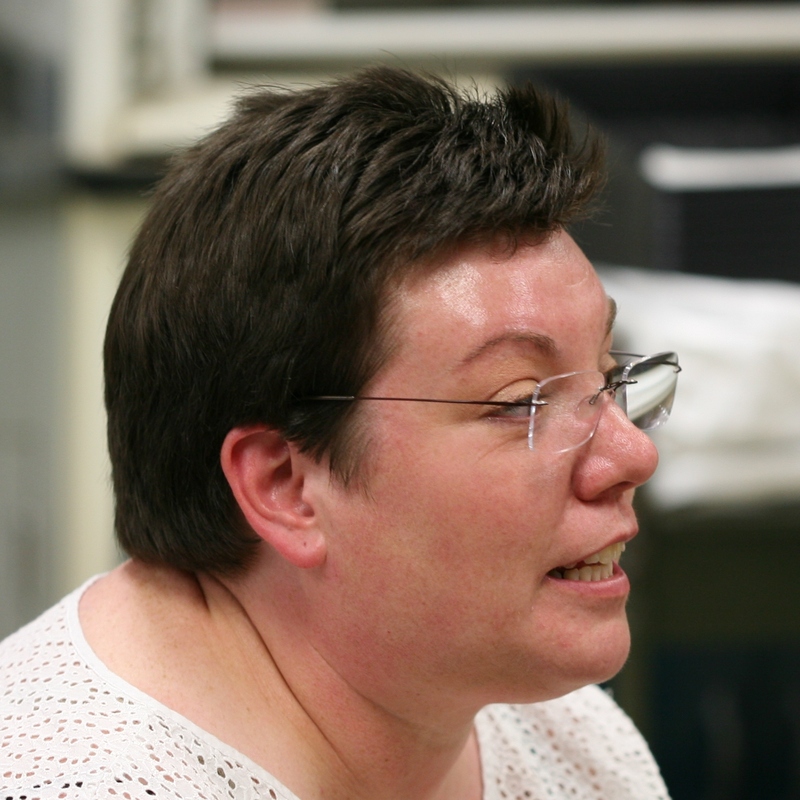 She is interested in how and when Grammia larvae begin to incorporate plant-produced toxins in their bodily tissues.